Jiří Stivín is a true renaissance man. Widely involved as a classical musician in especially early and Baroque music circles, the flutist and composer is also one of the most highly regarded jazzmen of the Czech Republic. The son of an actress and an inventor, he has absorbed both of his parents’ talents, combining their passion for expression and utility in an immediately recognizable style. On System Tandem, he joins guitarist Rudolf Dašek, a partner in crime since 1971. This out-of-print session owes its verve to time spent at London’s Royal Academy of Music, which put Stivín in touch with the exciting jazz-rock fusions proliferating in the late sixties, and found him in the midst of Cornelius Cardew’s legendary Scratch Orchestra. His project with Dašek—probably the most successful jazz outfit to emerge from his homeland—enjoyed great festival circuit success on the continent and abroad. System Tandem came on the heels of a collaboration with bassist Barre Phillips, and the latter’s balance of form and spontaneity is certainly in the air. Dašek, who passed away in 2013 at the age of 79, was another stalwart of the Czech jazz scene known for crossing the genre divide. From his trio with George Mraz and Laco Tropp (among other drummers) to work as soloist before the Prague RSO, his dedication to new music was unflagging. Together, he and Stivín stayed true to that exploratory spirit, working alongside Pierre Favre and Tony Scott, big bands, and countless other configurations. 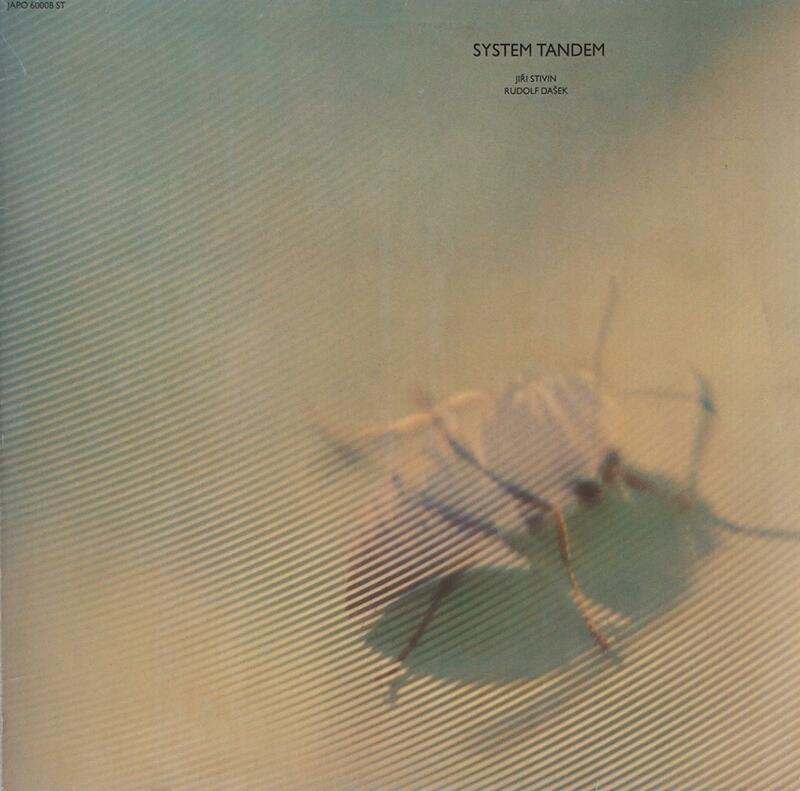 For its second album (following a debut on RCA Victor in Finland), System Tandem focuses the integrity of the music. Stivín pens the first cut and arranges the second. “Puddle On The Muddle” shows off the duo’s sense of light and shadow in a steely combination of registers. The lively interplay and ping-ponging of ideas allows Stivín to veer down wilder paths of squealing abandon in a robust opening gambit. The Moravian folk song that follows, “Forman Going Down The Valley” is the first of a few pairings of flute and guitar. The theme here is mountainous, painterly, and segues into the album’s remainder, all of which bears Dašek’s stamp. “Hey, Man (Let’s Play Something About Spain)” is the first standout and deepens the fluted streams of its predecessor. Buoyed by echoes of “Hasta Siempre” and quasi-flamenco touches, Stivín jumps into the deep end in another inspired solo turn. He speaks in tongues, becoming more vocal by the moment, for stretches abandoning the flute altogether. “What’s Your Story” mark’s the flute’s last appearance in a forlorn piece of restrained melodic shape. As it progresses, the virtuosity adjusts its sights a few clicks to the left. Stivín breaks out the soprano for “Shepherd Song,” evoking a dance party of undomesticated wildlife. This leaves us with the album’s pièce de résistance, “Puzzle Game.” For this marvelous foray into Baroque territory, Stivín plays a dizzying recorder against an invigorating Django Reinhardt rhythm. Dašek’s finger picking works wonders in the final stretch. This rare gem is due for reissue not only for its content, but also because the lackluster engineering could do with an overhaul. At many points throughout, the guitar’s audibility is torn to shreds by Stivín’s sharp edges. This is especially true in “Hey, Man” and “What’s Your Story.” It’s as if Dašek were playing with his back to the listener, which makes him feel not so present and obscures his contributions. Thankfully, the recording levels are more graciously tweaked in the final track. Engineering caveats aside, the perks of System Tandem are in its well-muscled compositions. Building enough emotional resonance to undermine the need for a rhythm section is no easy trick for any unconventional duo, but Stivín and Dašek have no problems pulling the rabbit out of the hat. To all you vinyl collectors, I say: Seek this one out.